Poster session is 120 minutes. Please put up your poster on your designated poster board by 10:30am. Please come back to the venue when the session starts.Odd numbered posters will be in the first 60 minutes, and even numbered posters will be in the latter 60 minutes. Presenters can be at their poster for 120 minutes, or leave when it is not their time to present. Poster boards are 170cm high and 114cm wide. Pointers and tapes will be available at the venue. Presenters should use headphones when presenting sounds. There will be no power supply available at the venue. Presenting time is 25 minutes followed by 5 minutes Q&A. Presenters who wish to spend more time on Q&A may present for 20 minutes followed by 10 minutes Q&A. There will be 5 minutes between presentations for presenters to get ready, but this time may not be used for presentations or Q&A. Presenters should follow the chairs’ instructions. Presenters should be in the room at the time their session begins. Presenters should be seated at the front seats. Please wait for your turn in your seats. Projectors are available in all rooms. Presenters should check their laptop-projector connection before their presentations. 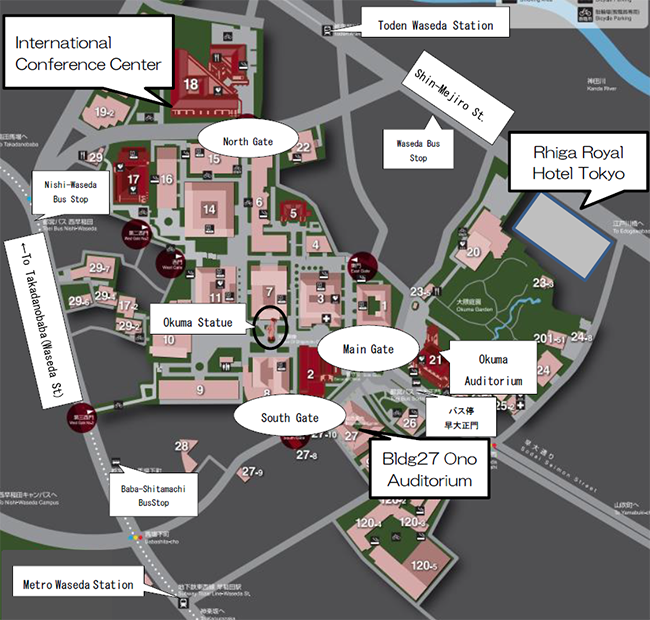 Student staff at Waseda University will be available for assistance at the International Conference Center from 12pm. We will not prepare laptops at the venue, so presenters should bring their own laptops. Please disconnect your laptop and projector as soon as the presentation is over. *Please note that the connector on the projector is a widely used D-sub 15 pin (Mini D-sub15pin or HD(3way)15pin) with 3 lines of 15pin. Presenters should be responsible for technical issues other than issues with the projector itself. Proceedings (on paper and USB) will be on sale at the registration booth (1000 yen for students, 2000 yen for members, and 3000 yen for non-members except students). Those attending the conference must purchase the proceedings as participation fee. Students of undergraduate and graduate schools must show their student ID at registration. Proceedings will be on sale only at the convention venue. The public symposium is open to all. All will receive a 90th anniversary gift. If you wish to become a member, please register at the registration booth. The convention party will be held on Day 1 (6PM, Saturday) at “Emerald”, 2nd floor of Rhiga Royal Hotel Tokyo (7 minute walk from Ono Auditorium). Participation fee is 6000 yen for members, 3000 yen for students. Please make a reservation by September 9th via website（https://goo.gl/EKGWZt）.You will also find the link on the PSJ website. Participation without reservation will only be accepted when there is vacancy. Pre-registration is recommended.